Is it possible to travel without spending boat loads of money? You bet it is. Even if you are currently following a strict budget at home, by doing some simple upfront planning, you can head out on a fun vacation without spending a lot of money. 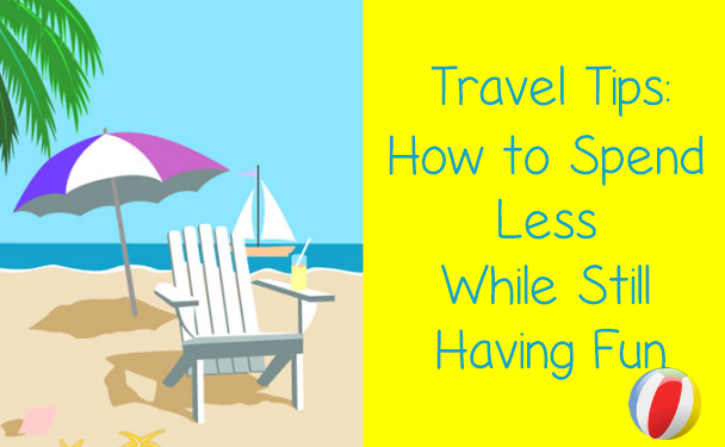 Let’s talk about some travel tips that will help you save money without missing out on any of the fun. How many of you use your credit card to pay for your vacation and then spend months or years paying it off after you return home? I know I have been guilty of that, and thanks to credit card interest rates, the trip ends up costing me way more money than it should have. Instead of being silly like I was, create a vacation fund and add it as an expense to your current budget. Each month when you pay your expenses move a small amount of money into your vacation fund. The amount may be $50 or it may be $200. It all depends on your current situation. The point is that overtime your vacation fund will grow until you reach a point where you have enough cash to go on a vacation. Being able to pay cash for your vacation is so nice. It may take you a year or more to save enough money for your vacation. That is okay, because it gives you time to plan your trip out well, and the more planning you do the more money you will actually save. Work with a travel agent to book transportation and accommodations. I know, you are thinking, but the online travel sites are fun and easy to book with and they always have good deals. Use those online travel sites to do your research about where you want to go, when you want to go and what you want to see and do. Make a good list of everything. Then, call a travel agent, give them your list, and see what they can do for you. Why? Because travel agents have access to unadvertised deals, especially when it comes to hotels. You see tour companies offer them lower rates that they can then pass on to their clients. But you won’t know that until you speak to them. As well, quite often you can pay for your trip closer to your departure time, which gives you more time to save your money. And you can ask them about cancellation policies, as well as travel insurance. Many of us love to go shopping while on vacation. Either for souvenirs, t-shirts, a new bathing suit, or even some new clothes that we just can’t find at a store near our home. However, if you do this as a part of your vacation you are significantly increasing the cost of your trip. Remember you want to be able to travel without spending a lot of money. If there are things that you need to buy specifically for your trip, such as sunscreen or a new pair of sunglasses, get them before you leave home instead of paying the extra high prices at your destination. As you plan your trip, allow yourself a small amount of cash for small purchases, but skip any big shopping trips that you would normally do, and allow yourself to simply relax and enjoy a quiet time away from home instead. Many years ago I travelled through Europe on a 10 day trip. Money was very tight but by following these tips we managed to pull it off. One of the things that made the trip easier was that we created a daily spending plan before we left, and then we followed it every day, which prevented us from spending more money than we actually had. By doing some research and planning out where we wanted to go during those 10 days we were able to comfortably travel on $120 a day for two of us. No, we did not stay in hostels or couch surf. I won’t even sleep on a relative’s couch, let alone a stranger’s couch. We mostly stayed in smaller hotels or in Bed and Breakfasts. We included a small rental car in our spending plan, as well as our daily meals. Most hotels and of course B&Bs in Europe include a nice breakfast in their daily rate. So we would budget for a light lunch and then a nice, yet inexpensive dinner. If your vacation includes traveling with children look for restaurants with kid’s menus similar to the ones that you probably have at home. As you create your spending plan make sure to allocate some cash for fun activities and unexpected expenses. Depending on where you go for your vacation, your activities might include amusement park rides, horseback riding, sailing, scuba diving, or even an afternoon at a spa. Traveling on a budget doesn’t mean you have to go without, it simply means that you need to plan wisely and be conscientious about what you spend your money on. If you find that once you are on vacation you want to spend more money on a certain activity you can easily look at your spending plan and see if there is an option to pull that cash from a different expense, instead of going overboard on your spending. If you have travelled on a budget before then you are most likely familiar with all of these tips, and more. If however, you feel that you can only travel when you are debt free and have a lot of spare cash, or need to pay with a credit card, then I think you will be surprised at how easy and fun it is to travel while sticking to a plan that helps you spend less.